Innovation is everywhere, and is being applied and embraced in every field for bringing in modernized modifications and to remain competitive in the race to digital transformation. Although all the industries have accepted and implemented innovation with open hands, the same is quite slow in healthcare industry compared to other sectors. As the pace of digital disruption is increasing across all other industries, the gap on the missed opportunity is getting more obvious on the healthcare front, and as a result, human lives are getting affected in many areas due to the lack of modernized health services. Although the acceptance rate has been slow, the wheel of massive change is still revolving, and several preliminary projects by healthcare providers have been outwardly evident. However, the real challenge for many healthcare organizations is to extend those pilots across their entire operations, and continue to make use of the full functionalities for effective healthcare operations. Technology tools are enablers of change, and their capabilities are not completely discovered yet. With the invent of new trends, the healthcare providers must decide on the kind of investments and their return on investments (ROI) on several aspects of health care delivery. It has been observed that a few areas of delivery such as collaboration, equipment search, staffing, and cyber security offer highest ROI and are easier to adapt to technology. Streamliningof legacy systems to improve patient records visibility and accessibility to the records. With the advent of technology, Hospital Management System (HMS) has been implemented in almost all the hospitals world-wide, making the records handling simpler. Modernizing this feature is a stepping stone for healthcare transformations. Mobility Solutions between caregivers and patients across all platforms at real time. With mobility, it has become increasingly easier to stay connected from anywhere and anytime. The doctors can view the patient records and suggest medication through just a matter of few clicks. Mobility is truly bringing the transformation into every industry and healthcare is also not far behind from embracing benefits of the same. Confidentiality– patient confidentiality and other critical related files and documents must be retained for any future instances, and to analyze patient health for future well-being. Migrating to better technologies and reducing IT infrastructure costs, enabling revenue growth for healthcare industries. With many services being mobile and instantly available, there is a lot of saving involved in infrastructure management. Robust healthcare solution that covers online clinical appointment, disease diagnosis and patient checkup without hospital visitations. In the present days, you can book appointments from anywhere in just a matter of a click with any doctor with any specialization. 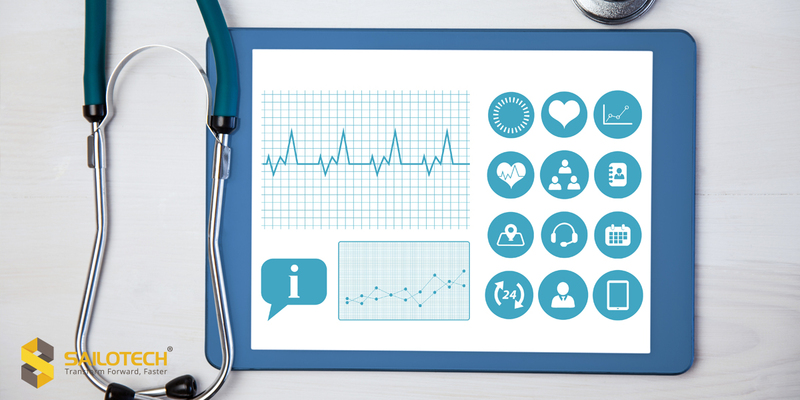 With the current user-friendly and accessible screens, a technical user is much in reach of the advanced technical features useful in healthcare. By conquering the above challenges, healthcare also can smoothly sail to the path of digital transformation, and get benefitted by the advanced technological equipment and features, which can help them stay ahead of their competitors.